Having launched the website www.all-about-agatha-christie.com This blog was created in response to the emails I received from other Agatha Christie fans telling me just exactly what they think about a wide-ranging selection of Agatha Christie related matters. My son David (see profile below) has very kindly offered to host the Agatha Christie blog for me, along side his forensic psychology blogs which you should check out if you get the chance - fascinating stuff. On the very last page of her autobiography, Agatha Christie refers to, ‘Two summits of ambition fulfilled.’ I mention one of these – ‘the proud ownership of a bottle-nosed Morris – a car of my own!’ - on the main website page that discusses ‘The Man in the Brown Suit.’ It was the money she received for the serial rights of this novel that enabled her to make this exciting purchase. I find it extremely touching that with all her wealth, and with all the adulation she received, these two very different – and in materialistic terms, very simple – things, were amongst her fondest memories. 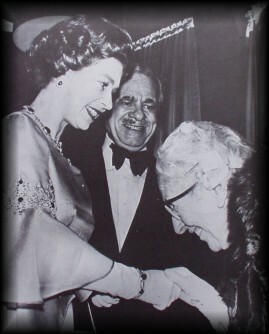 And as Her Majesty passes her eightieth birthday, it is interesting to speculate whether, as she look back over her life, her meeting with Dame Agatha ranks as one of her special moments. It wouldn’t surprise me at all to find that it does. I've had a passionate interest in psychology for over 20 years. I began studying psychology in 1990, and I've been teaching psychology in some capacity or another since 1998. I have a first class honors degree in psychology and a Masters in Occupational psychology from the University of Sheffield (UK). For a number of years, I was a lecturer in psychology at the University of Huddersfield (UK). I have built four websites around my teaching and research interests. My Psychology Student Guide published on the Kindle in 2012 is an international #1 Best Seller. My latest book, The Incredibly Interesting Psychology Book was published in May 2013. About Mary: I've had a passionate interest in psychology for over 20 years. I began studying psychology in 1990, and I've been teaching psychology in some capacity or another since 1998. I'm a sixty something grandmother and the most important thing in my life is my family, nothing else comes close. I enjoy all sorts of literature and Dickens, the Brontes and (particularly) Jane Austen are among the esteemed names, which line my bookshelves, but I have a particular liking for murder mysteries. Sherlock Holmes, Lord Peter Wimsey, Cadfael, all wonderful amateur detectives; and the professionals; Inspectors Alleyn, Wexford and Morse. Just a few of the many sleuths with whom I have beguiled away many an hour. But it is Dame Agatha Christie who to my mind stands head and shoulders above all the others. So I thought it might be a good idea to put down in writing my thoughts about her work and maybe share them with others who agree (or even who disagree) that she is undoubtedly worthy of the sobriquet so often bestowed on her - THE QUEEN OF CRIME.